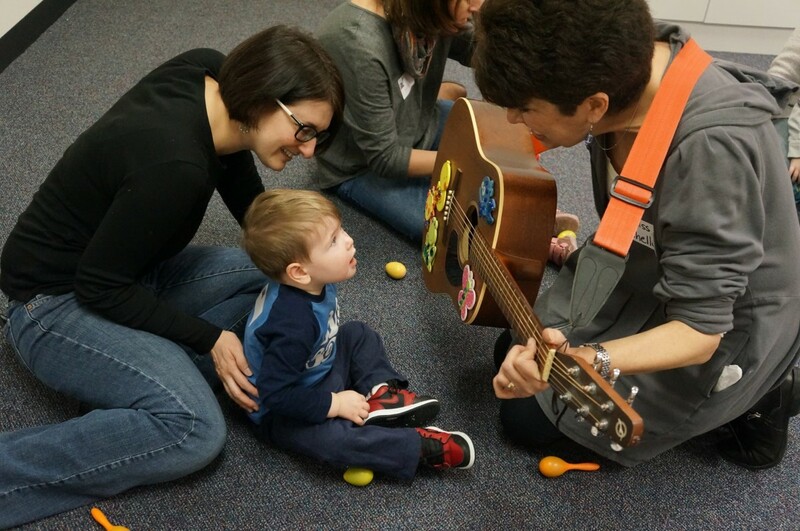 Beth Deiter and Michelle Hunter are the founders and co-directors of My Kind of Music, a parent-child music program in Buffalo Grove, IL that offers classes with therapeutic accommodations for children with disabilities. In honor of Jewish Disabilities Awareness month, we interviewed Beth and Michelle about their unique program and how enrichment activities and community building can be so helpful for both parents and children with disabilities. How is My Kind of Music different from other music classes for young kids? As a class that happily welcomes registration from parents of children with special needs, we seek to encourage the participation of each child to his fullest. 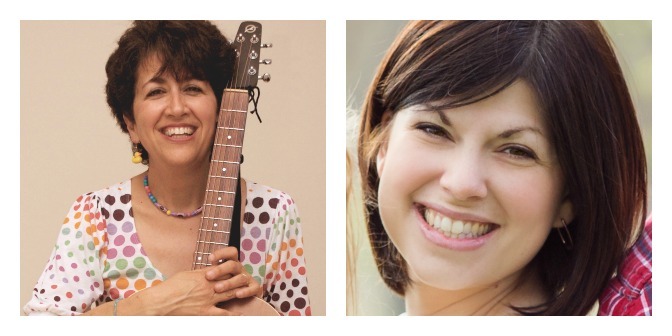 To that end, unlike typical music classes, My Kind of Music classes are co-taught by both of us: Michelle is an early childhood music specialist, and Beth is a speech-language pathologist. Further, our classes are limited in size to a maximum of 8 participants with a caregiver as opposed to the typical 15-20 children per class offered within the community. This small class size helps to control the noise and chaos that can sometimes occur in such a busy class (especially with the addition of music, instruments, and dancing). And with the high adult-to-child ratio, each child is guaranteed attention and the ability to take a turn participating. What’s more, by participating in My Kind of Music classes, parents experience a sense of community by interacting with other parents of children with special needs who may better understand and relate to their experiences. Because when treating children with special needs there is so much emphasis on home-based interventions–so that a child might be allowed to remain in his or her natural environment during different types of therapies, in our experience, the result is that many parents can feel isolated and without a support network of other parents. What kind of therapeutic accommodations does My Kind of Music provide? More specifically, some accommodations include planning activities with increased repetition, using visual aids and schedules, and providing extra time for transitions. Additionally, after working together for a while now, we have become masters of “real-time collaboration.” These are the accommodations that we make on the spot and as we see a need. For example, during one class while we were singing our “hello” song, we realized some of the kids were having a difficult time singing along. We exchanged glances and quickly modified the words to create a more repetitive phrase and used a slower tempo. What kinds of tips/tools do parents come away with, after attending a class? Whether parents are learning to use a picture schedule to help with transitions, to use language temptations to encourage requesting, strategies for playing early social games, or ways to incorporate music into everyday routines, they frequently report taking away new ideas from our classes to use at home. And, of particular benefit, parents also come away with tips/tools from the other parents in the class who may have personal experience with a particular concern. Can you describe the make-up of a typical class? Our classes are appropriate for children with all abilities; therefore we really see a wide range of skills and needs. We have some children participating who only receive one therapy (i.e. children with speech-language delays), and we have some children who receive many therapies (i.e. children with Autism, Down Syndrome, Childhood Apraxia, low tone, developmental delays, and genetic disorders). Although each child’s skills and needs are different, there is so much that they and their parents share, and it’s interesting to see the relationships that develop within each class. What else would you want to share with parents of children with special needs who might not think they are up to the challenge of attending a music class with their child? Music is a thing of joy that all children and parents can appreciate. It brings people together and is the perfect vessel for providing that parent-child bonding time so needed early on. Music involves all of your senses. You hear it with your ears, see it with movement, feel it with your body, and absorb it with your soul. This makes music one of the most effective methods of teaching and learning, and we want all children to have an opportunity to experience music in the early childhood years. Good parent-child music classes are not “performance-oriented.” They are not about sitting and listening to a performer, but rather they attempt to include all the participants through play and parent partnership. Think about what you and your child are able to get out of such a program and enjoy whatever it may bring. If your child is struggling in such a venue, talk to his/her therapists outside of the class about ways to incorporate more accommodations, especially if the music teacher isn’t as familiar with how to adapt the class. Given the right support, all children and their parents can participate and enjoy music together. If you are not located near a My Kind of Music program, we highly recommend that you seek out a fun activity for you and your child in addition to what we understand is an often very busy therapy/medical schedule. With support, there are ways to enhance your interactions and bonding time while continuing to support your child’s developmental growth. Additionally, this time out of the house is extremely important not only to maintain your sanity, but also to connect with other parents in a supportive environment. Whether it is through a music class or another parent-child recreation CLASS (i.e. gymnastics, storytime, art, swimming), that special time you share TOGETHER can be one of the most memorable and ultimately rewarding times for you and your child.